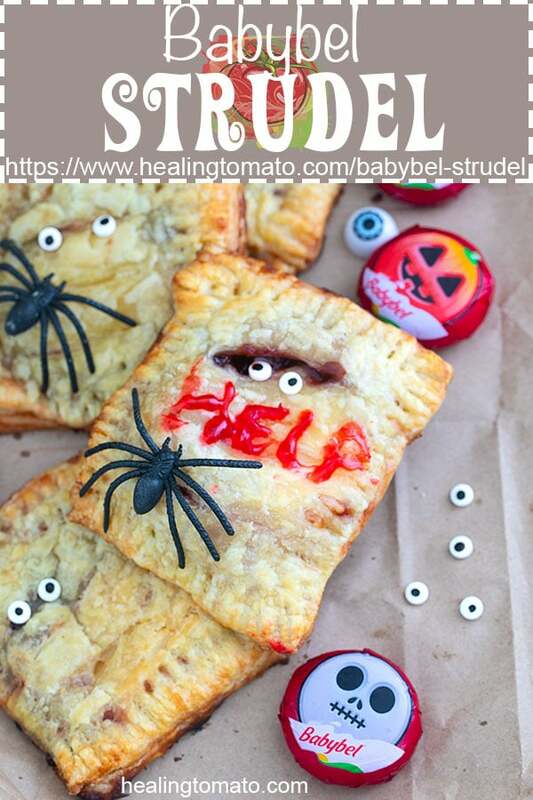 Easy Babybel strudel recipe that works as a snack or a dessert. Needs only 4 ingredients to make and ready in 30 minutes. How do you eat your Babybel cheese? I like to peel mine then pop the whole thing into my mouth! As I savor the cheesy goodness, I find myself feeling uplifted by its delicious, slightly salty flavor. Its one my all time favorite cheese of all time. 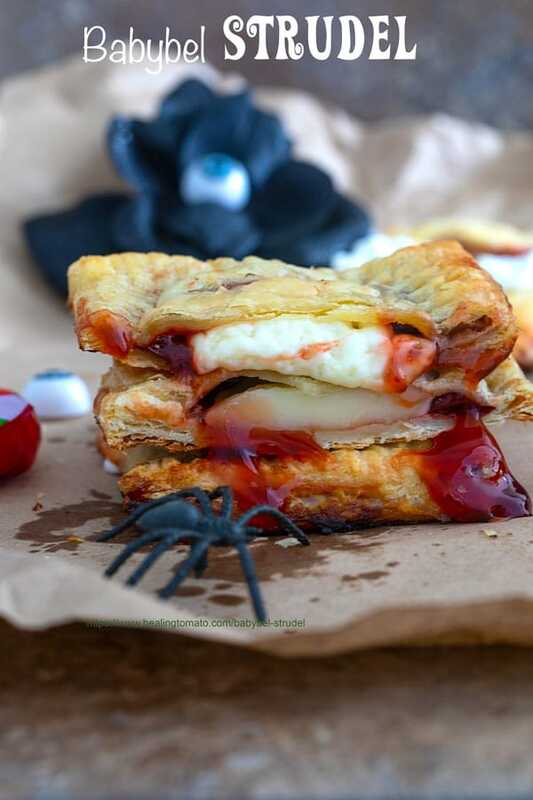 This time, I decided to put into a recipe that is both delicious and spooky! 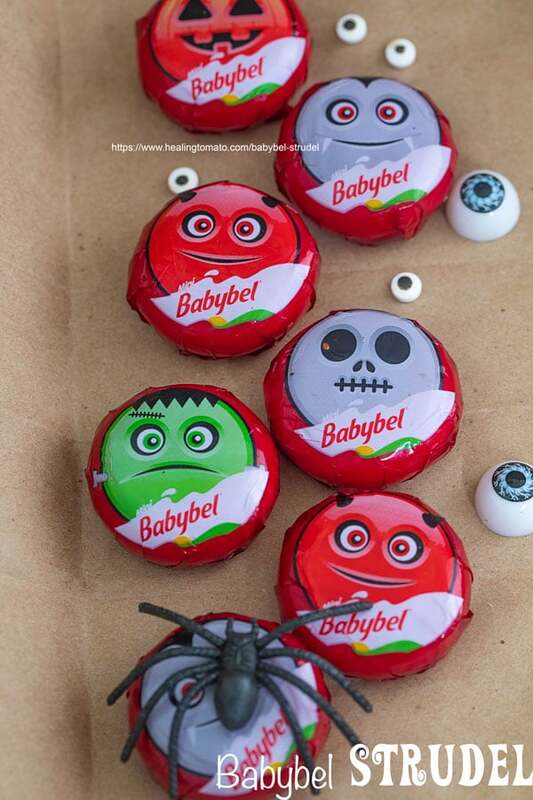 Babybel has come out with a limited time Halloween packaging of their cheese. Their original flavored cheese has new cellos with different icons of Halloween. I think the Dracula one is my favorite. Which one is your favorite? Lucky for you and me, Target is giving 10% off these Mini Babybel Cartwheel. This deal runs through early November, so, hurry now. Collect these cello wrappers, like me. Babybel Cheese contain 100% real cheese. They use real milk in their cheese making them a good source of calcium and protein. They also use vegetarian rennet in their cheese making process. Since they don’t use any artificial growth hormones*, their cheese is vegetarian friendly. How cool is that!? I went with cherry pie filling, but, you can use any fruit filling or just use fresh fruit. I tried it with green apples and agave syrup. It was so delicious! What’s your favorite filling recipe? I have always loved eating Babybel with apples. They make for a fun snack and its one way to get me to eat an apple. When I was at target, I also noticed that they also sell babybel with crackers. I tried their cheese crackers with mini Babybel which turned out to be a great snack idea. Its not just fruits and pretzels that babybel can be paired. 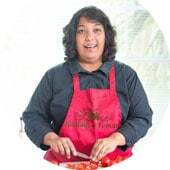 I have served them with veggies like carrots, celery and broccoli. Or, serve with olives or banana peppers too. The possibilities are endless when it comes to using Babybel as a snack. There are so many possible combos that I know I will never get bored of eating them. So, run to Target today and get 10% off Mini Babybel Cartwheel until November. Come back and tell me your favorite way of snacking on these Babybel Cheese! I love Baybel cheese! And that they are perfectly portioned! The Halloween covers are so fun and I love the skull one!! Going to grab a few bags of these for Connor’s lunchbox! What a cute appetizer idea! 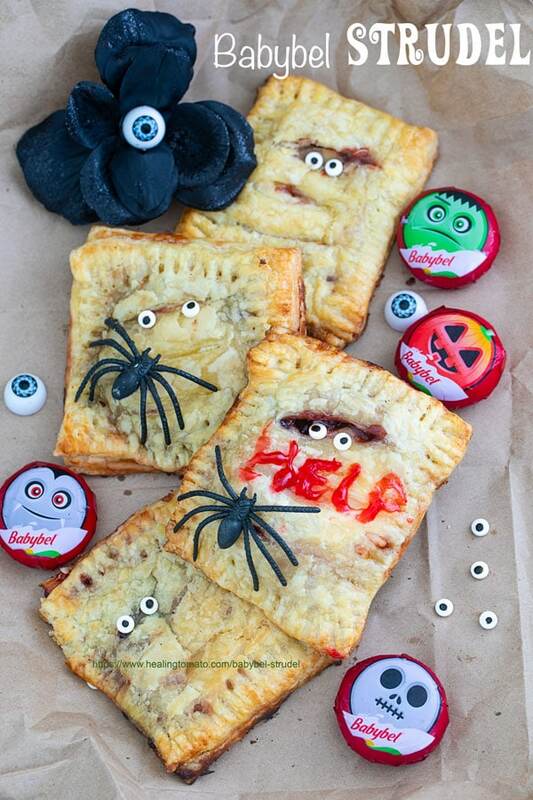 I need to make these for Halloween! I love them all! S o so cute and so very clever! The fact they are made with baby bell cheese so I know they will taste amazing too! Their cheeses are so yummy! 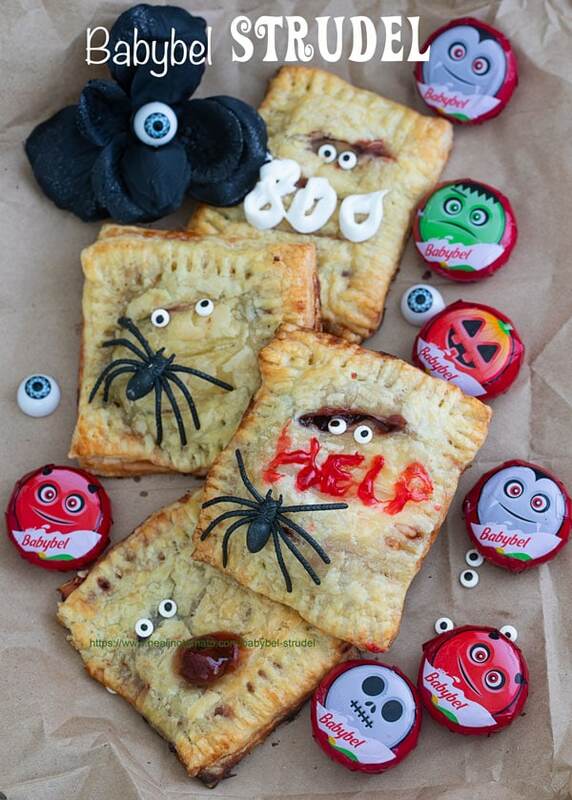 Rini, this is such a creative way to enjoy babybels this Halloween, but I love the idea of trying some of the other tasty combos too. 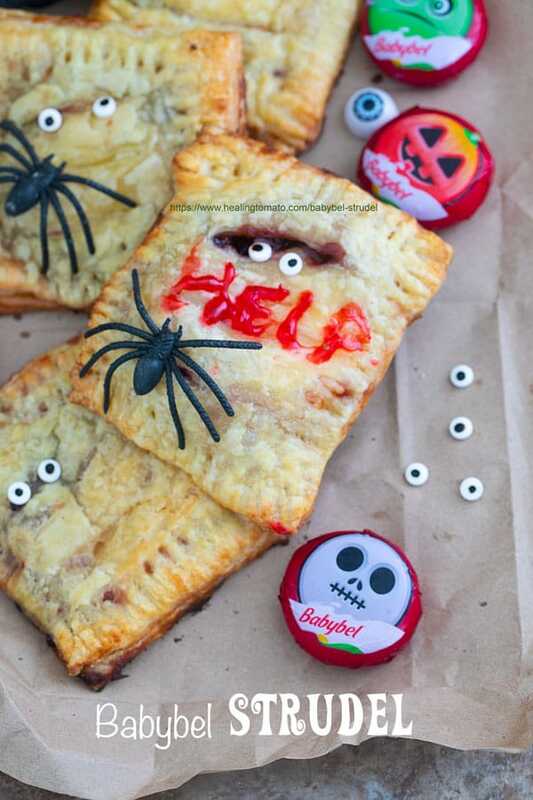 Simple way to serve strudels all year long! These are so dang fun! And I love the helpful list of other filling ideas for making it my own. i’m totally going to use that. What an adorable delicious idea! 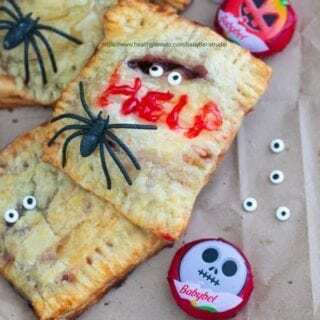 The kiddos would love making them and everyone would love eating them! Oh my gosh, these are so cute! and the babybel is just adorable! The Frankenstein is my favorite!! I love all of the creative combinations you suggested too, just delicious! These are adorable! Even I could make them. When I was a kid I used to take these babybels to school in my lunch bag. They are yummy! Thanks for the reminder and the recipe.